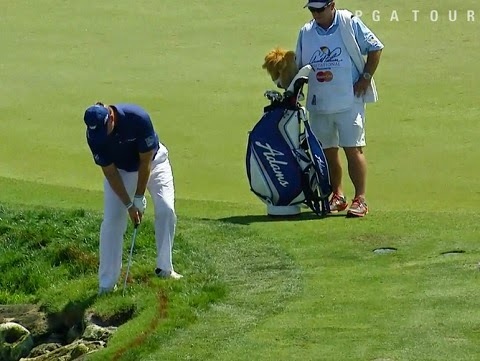 Rules of Golf: Did Ernie Els Ground His Club in a Hazard? There was a Rules incident at the Arnold Palmer Invitational at Bay Hill, Florida, last Saturday. Four-times major winner, Ernie Els, was reported to have grounded his club in a water hazard on the par-5, 6th hole. However, when PGA Tour Tournament Official, Steve Rintoul, reviewed the video tape of the incident he could not determine that Els had grounded his club, though it was obviously touching the growing grass before he made his stroke from the hazard. You can decide whether you would have agreed with this ruling by clicking on this video. If the grass had been compressed to the point where it would support the weight of the club, the club is considered grounded. "The tape didn't show that the club was grounded, even though the clubhead was in the grass". Nevertheless, there must have been some doubt remaining, because the Head Rules Official for the event, Mark Russell, subsequently spoke to Els after his round, who claimed that “he had not soled his club”, so no penalty was assessed. Some viewers of the video clip may be wondering why Els played his 6th stroke from back on the centre of the fairway. He had taken advantage of Rule 26-2a(i)b, which was the subject of this earlier blog of mine. The following day, at the same event, a penalty of two strokes was imposed on Keegan Bradley for the most basic of Rules errors. With his ball at rest some yards off the putting green, he brushed sand from the apron of the green that was on his line of play. Check out the (poor quality) short Vine video clip at this link. Sand and loose soil are loose impediments on the putting green, but not elsewhere, Definition of Loose Impediments. It is worth noting that sand that is on the putting green may be removed by any means (e.g. putter head, back of hand, towel, brush! ), providing the player does not press down on the line of putt, Decision 23-1/1. (Edit 30th March 2015: It should be noted that any sand deposited on the player's ball or line of play, resulting from another player's stroke after the ball had come to rest, may be removed without penalty, Decision 13-2/8.5). Speaking of hazards, if your ball is in a bunker and you don't get out with your first shot, can you take an unplayable lie, or do you have to keep hitting until you get out? Big argument about this over the weekend. If the unplayable ball is in a bunker, the player may proceed under Clause a, b or c. If he elects to proceed under Clause b or c, a ball must be dropped in the bunker.